Vanilla Builders Extension is a mod that adds all the missing stairs, slabs, fences, gates, and even walls for vanilla blocks that ain't got any. 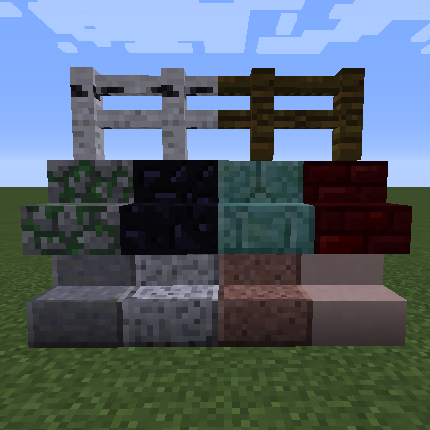 The blocks that are added use the textures of their respective vanilla parent-block. That way they will work with every resource pack. You found a bug or have a problem? You have a suggestion or want to state your opinion? What does the mod currently offer? Currently there are stairs, slabs, walls, fences and gates for 60 blocks and a Smooth Stone block (the default stone slab). Override Vanilla: - Overrides the Vanilla Minecraft recipe for Stone Slabs and Nether Brick Fences. Grass Crafting: - Allows crafting Grass Blocks from Tall Grass and Dirt Blocks. Special Grass Crafting: - Allows crafting Grass Stairs or Slabs from Tall Grass and Dirt Stairs or Slabs. Mushroom Crafting: - Allows crafting Red or Brown Mushroom Blocks from Red or Brown Mushrooms. Special Mushroom Crafting: - Allows crafting of Mushroom Stem or Insides Blocks from Red or Brown Blocks. Concrete Crafting: - Allows crafting of Concrete blocks from Concrete Powder and a Water Bucket. - Added compatibility with Quark. If detected blocks that are duplicated in both mods will not be loaded. Can someone backport this mod to 1.8.0? That would be great. I'm good. Thanks though. Plus I feel that mod doesn't do them right, i'e treats them as snow. Once I have a job again or win the lottery, I will continue the mod I had modder work on for me. Thanks though. Plus took you way too long to respond and this mods method of slabs don't work with kee slabs. KleeSlabs has to add the compatibility for this to work. Unfortunately I cannot do it. You could request it though. Do you think you could also add normal ice block variants in this mod? This is added in the next version. Should be up in the next couple days. Updating the latest few issues now. I will look at converting to 1.13 after that. Ok great. I have moved on to fabric 1.14 tho. It would be totally fantastic if you made a version for that but it's quite a lot of work so I understand if you don't want to. Just what I was looking for my Peaceful Pack! I needed this cause I build my roads out of slabs and stairs, and now I can make black concrete slabs and stairs for my highways! Up to you, but would love to see it work while pushable, and etc. Levels 1,4, and 8 on the top half need ability like normal slabs do as well. For some odd reason i can't configure this mod. The button "config" doesn't appear in forge ingame menu. What could cause such problem? Also is there any way to configure it without using forge ingame menu? Figure out that i'm braindead and forgot about existence of config files in game directory. Anyway, great mod, absolutely love it. Recently, the memory requirements to run my modpack jumped a lot. To my surprise, this mod seems to be the culprit. I was already running with mushroom and grass blocks turned off in the config, so I went through and turned off a bunch of other blocks I wasn't using. I think turning something off in fences dropped the memory back down to something expected. BTW: There's no glass wall in the config. Is there a reason, or is it an oversight? If everything is enabled, it does add a lot of blocks. I haven't ran into an issue with memory myself though. If it is not in the config, I just missed it. I will add it in there when I get a chance. Traveling for work for the next month though so I won't be able to for a bit. That's fair. I was surprised that this mod caused my memory needs to jump in the way some larger mods didn't, but I don't have a good sense of what requires a lot of memory. It did seem that something in fences caused my memory requirement to drop a lot, but I'm not sure I'm going to go back and turn everything off/on to test again anytime soon. Another note: the config is a bit tricksy. If I turn off a block in the general config at the top, like mushrooms for example, the entry for the specific type of block (like fences or slabs) MUST be left at true or the game crashes on load. Thanks for the mod! I'm really enjoying my obsidian walls and gates, and I'm looking forward to glass walls around my planned glass palace :). Thanks for the feedback. Always good to hear. I will mess with the config a bit more when I get a chance. Override Vanilla: - Overrides the Vanilla Minecraft recipe for Stone Slabs and Nether Brick Fences." Cannot craft redstone repeaters due to the recipe for stone slabs being overridden by this mod. How do I disable this recipe from your mod? Is this really an "option"? You can change that option in the config if you want, but it is better if enabled otherwise the recipes make no sense. Smooth Stone slabs are crafted with 3 smooth stone and the vanilla stone slabs are crafted with polished stone. Nether Brick fences and gates get correct fence and gate recipes. Vanilla recipe for stone slab is unchanged and smooth stone slabs are ccafted with polished stone. Nether brick are unchanged and the recipes are also swapped. Let me know if you still have issues or questions.